Tonight, join the Historical Society of the Phoenixville Area for their Quarterly Meeting at 7:30pm at the Phoenixville Bank and Trust Company, 564 Nutt Street in Phoenixville, as Aaron Heckler, historian and author, presents, "The Schuylkill Navigation (Canal): A Picture Postcard Journey Downriver." 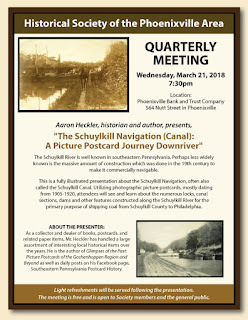 This is a fully illustrated presentation about the Schuylkill Navigation, often also called the Schuylkill Canal. Utilizing photographic picture postcards, mostly dating from 1905-1920, attendees will see and learn about the numerous locks, canal sections, dams and other features constructed along the Schuylkill River for the primary purpose of shipping coal from Schuylkill County to Philadelphia. Light refreshments will be served following the presentation. The meeting is FREE and is open to Society members and the general public. Note: This was originally scheduled for last Wednesday but the snow caused it to be pushed back a week. Please disregard the date in the flyer below.